Now this is an interesting way to cycle Col de la Madeleine. Note: if you are looking a 2012 Stage 11 Preview of Madeleine – click here. Now this is an interesting way to do Col de la Madeleine. 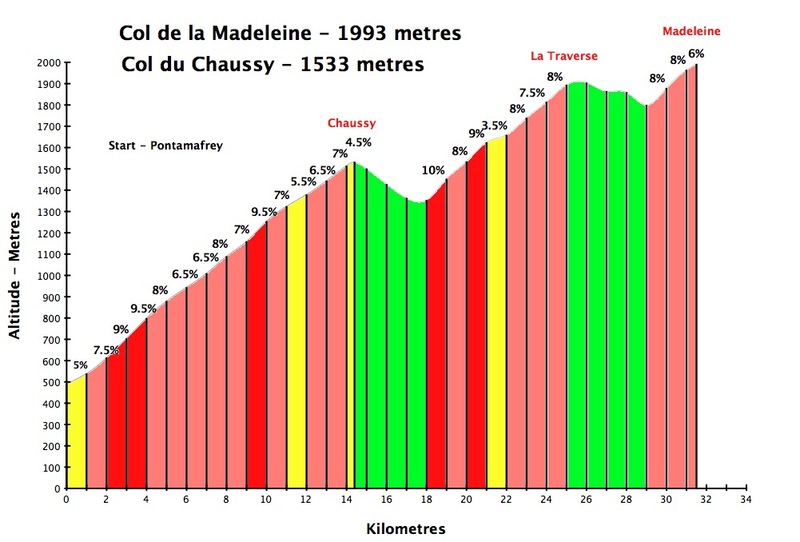 First climbing Col du Chaussy and then following small, mainly unpaved, roads to Madeleine. 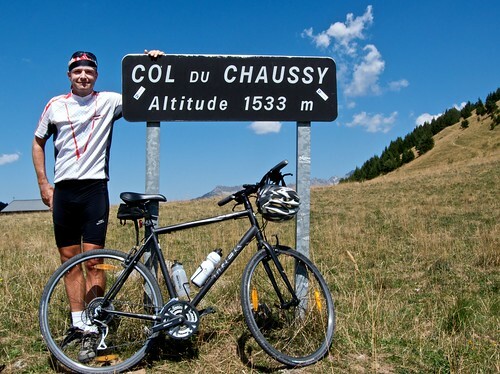 Col du Chaussy is probably best known for the truly unbelievable hairpins at the start – the “lacets de Montvernier.” But beyond this it’s a big climb with more than 1000 metres of ascent. 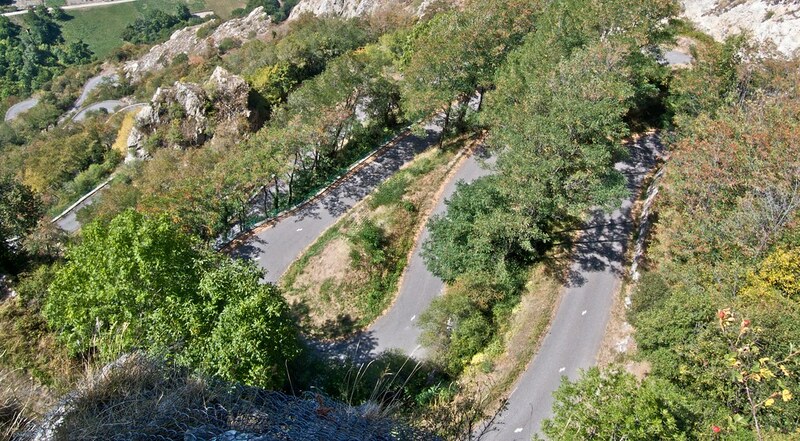 The lacets de Montvernier is a special 3 km stretch with 17 hairpins as the road virtually climbs a cliff. It’s very difficult to photograph from the road but I got one shot hanging over the cliff from the picturesque chapel at the top (it’s worth clicking for a bigger version). After the hairpins, it’s still a very interesting climb winding up through alpine fields with a great stretch along a cliff road a few kms from the top. From Col du Chaussy until the last 2 kms, the majority of the road is not paved and is definitely NOT suitable for a road bike. This stretch is great. 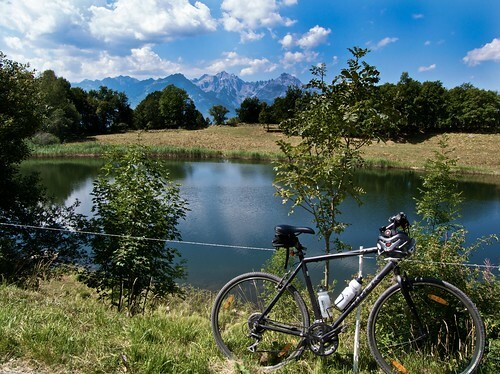 No cars, lots of cows, great views – and the Lac du Loup (wolf lake). At “La Traverse”, the road crosses back into the valley with Madeleine, and joins the main route a couple of kms from the top. This was a hot, tough ride and I enjoyed my reward at the restaurant at the top: a gauffre myrtilles! Descending Madeleine, I took the D76 instead of the D213 which is the classic Tour route. The D76 descends on the opposite side of the huge gorge and has the advantage of absolutely no traffic. Frankly, it seems a more interesting route than the D213 for the next time I visit – and is do-able by road bike. Wow! Super photo des “lacets de Montvernier” and it looks like it was so quiet. 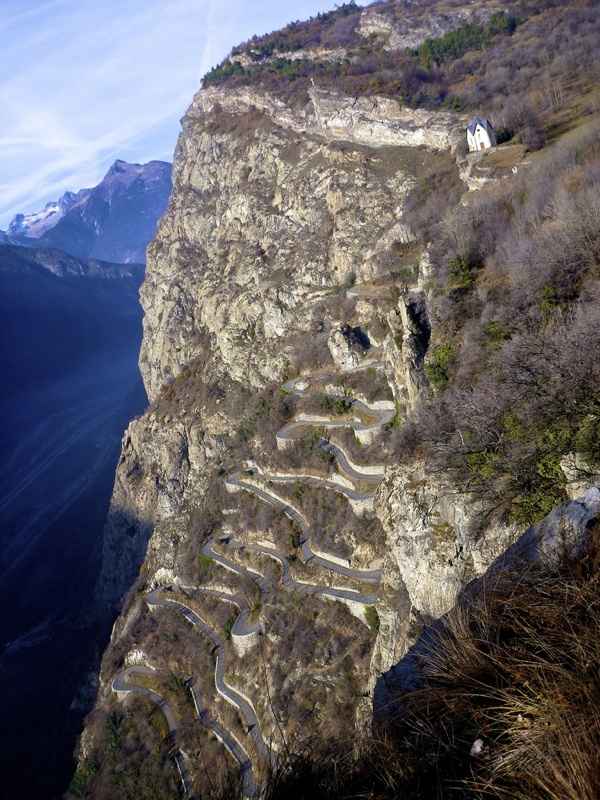 Yes, The route from Pontamafrey, up the Lacets de Montvernier until (but not past) Col du Chaussy is perfect for a road bike. 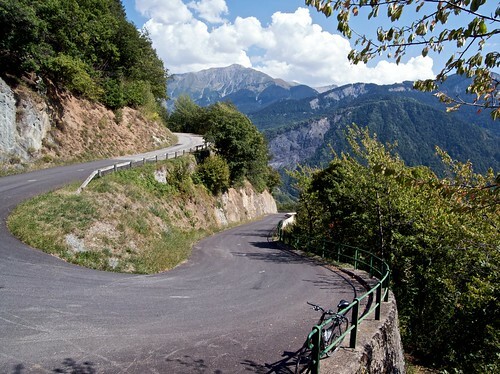 I wish i have seen this review before i took my Orca up the road to the top of the Madeleine….i was on edge all the way up………my mate puncture just before we hit the tarmac again…..but it is easily possible on a road bike!!!! I road the Col du Chaussy via les Lacets de Montvernier yesterday. 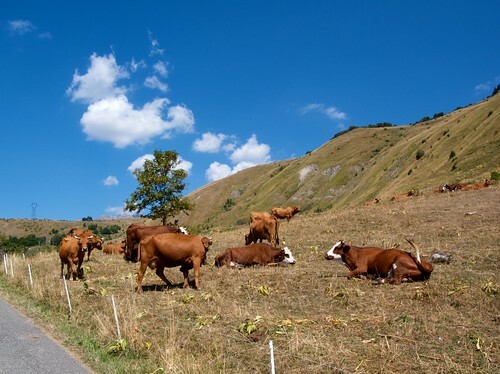 I say ‘via’ Les Lacets de Montvernier because it is worth noting that the Lacets are not on the main road up the col – route D77 – the Lacets are on a side route – route D77B that joins the main route in an alpine meadow just above the Lacets. The Lacets and route D77B start right at the bottom of the valley in Pontamafrey and once you have done them there is still a lot of climbing to the end of the pavement. It is a very nice ride on a quiet road up to where the pavement ends and the dirt begins at the top of the col. It is a pretty big climb. 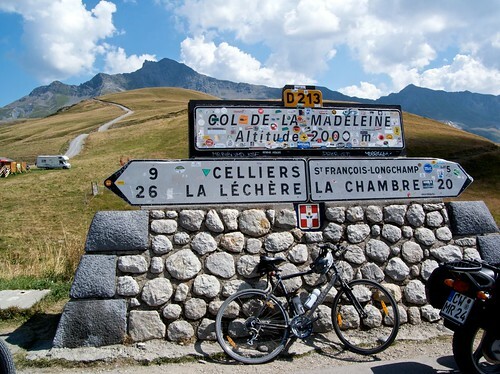 To put it in perspective the summit is at 1,533 meters, the same elevation you hit when you are between five and six kilometers from the top of the south side of le Col de la Madeleine. I rode the south side of both cols yesterday and my Garmin said it was about 8,600 feet of climbing. When I rode up the Lacets there was quite a bit of tree debris – pinecones, small branches and such on the roadway. When I came down I was surprised to see a street sweeping vehicle about to head up it. Evidently the locals rightly take pride in their Lacets. Col de la Madeleine via Col du Chaussy. How long is the unpaved stretch? Want to do this on road bike. 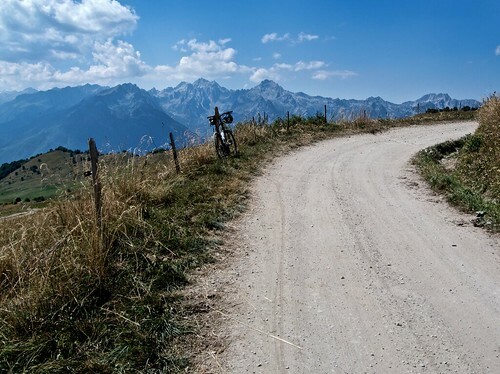 The road from the Col du Chaussy down to Montaimont on the way to the Madeleine valley is now all paved ! No issue with road bikes anymore ! If the rumours are correct, this ride could feature in the the TDF next year!!!??? Still just rumours, but St Jean is likely to be a host town again. 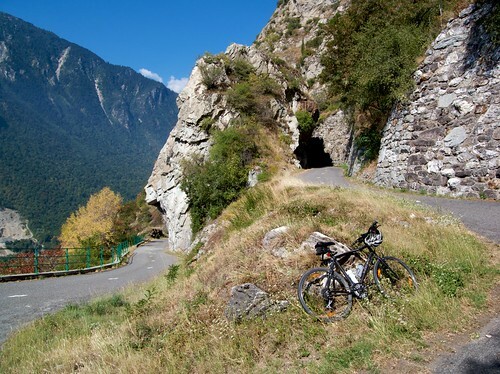 It would be great to do this ride, I was going to take clients this year to ride up the chaussy, but we had a rest day and then rode over the Iron Cross to Vaujany.